Hardwood handle on hazel, ash or chestnut shank. Handle should be held around chest-high. As above but with shaped staghorn handle, capped with polished buffalo or cow horn. Handle shape varies depending on antler available but is generally straight or slightly curved. Compass and finger grips fitted if required. Handle should be held around chest-high. The staghorn "coronet" handle which can have an inbuilt whistle. Handle should be held around chest-high as a hiking stick. "Cheap and chearfull" plain hiking staff with optional wrist strap. A general purpose stick that won't make a big hole in your pocket. Usually Hazel, Ash, or Chestnut. Should be held around chest-high. Also useful as beating sticks in the woods - but, as with any stick, if used for this purpose we can't guarantee they will last long! 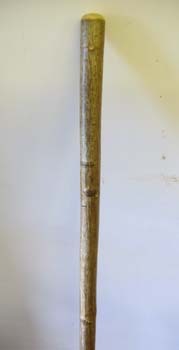 Plain hiking staff, as above but length between 43 and 54 inches max. Should be held around chest-high. Plain hiking staff, as above but length from 55 up to 58 inches max. Similar to a "Scouting staff", as used by Boy Scouts.